Dr Lily Asquith modelled data from the giant Atlas experiment at the LHC. She worked with sound engineers to convert data expected from collisions at the LHC into sounds. "If the energy is close to you, you will hear a low pitch and if it's further away you hear a higher pitch," the particle physicist told BBC News. "If it's lots of energy it will be louder and if it's just a bit of energy it will be quieter." The £6bn LHC machine on the Swiss-French border is designed to shed light on fundamental questions in physics. It is housed in a 27km-long circular tunnel, where thousands of magnets steer beams of proton particles around the vast "ring". At allotted points around the tunnel, the beams cross paths, smashing together near four massive "experiments" that monitor these collisions for interesting events. Scientists are hoping that new sub-atomic particles will emerge, revealing insights into the nature of the cosmos. Atlas is one of the experiments at the LHC. An instrument inside Atlas called the calorimeter is used for measuring energy and is made up of seven concentric layers. Each layer is represented by a note and their pitch is different depending on the amount of energy that is deposited in that layer. The process of converting scientific data into sounds is called sonification. Dr Asquith and her team have so far generated a number of simulations based on predictions of what might happen during collisions inside the LHC. The team is only now feeding in real results from real experiments. "When you are hearing what the sonifications do you really are hearing the data. It's true to the data, and it's telling you something about the data that you couldn't know in any other way," said Archer Endrich, a software engineer working on the project. 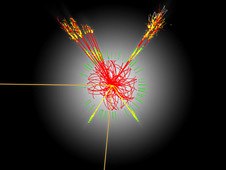 The aim is to give physicists at the LHC another way to analyse their data. The sonification team believes that ears are better suited than eyes to pick out the subtle changes that might indicate the detection of a new particle. But Richard Dobson - a composer involved with the project - says he is struck at how musical the products of the collisions sound. "We can hear clear structures in the sound, almost as if they had been composed. They seem to tell a little story all to themselves. They're so dynamic and shifting all the time, it does sound like a lot of the music that you hear in contemporary composition," he explained. Although the project's aim is to provide particle physicists with a new analysis tool, Archer Endrich believes that it may also enable us to eavesdrop on the harmonious background sound of the Universe. He said he hoped the particle collisions at Cern would "reveal something new and something important about the nature of the Universe". And Mr Endrich says that those who have been involved in the project have felt something akin to a religious experience while listening to the sounds. "You feel closer to the mystery of Nature which I think a lot of scientists do when they get deep into these matters," he said. "Its so intriguing and there's so much mystery and so much to learn. The deeper you go, the more of a pattern you find and it's fascinating and it's uplifting."